Manufacturer & Supplier of Moisture Analyzer. Our product range also comprises of Weighing Scales, Drum Filling Systems and Semi Automatic Bagging System. We are a paramount organization that is engaged in providing reliable Moisture Analyzer to our clients. These hi-tech moisture analyzers are specially engineered to measure moisture. 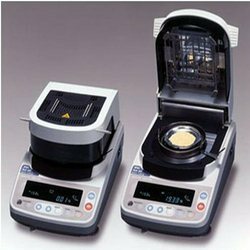 These analyzers feature latest weighing technology and state-of-the-art halogen heating, which enables faster and more precise measurement. We offer our moisture analyzers at a market leading price range. Our procuring agents conduct a prior test to ensure our raw materials authentic and best in class.